How much can a Bullitt bicycle haul? 1 kid, 2 kids, 3 kids, 4! A while ago my brother-in-law suggested that I was perhaps overly aggressive in testing the limits of our cargo bikes. I can’t deny it. I put two kids on a Brompton folding bicycle (and it was so much fun that I haven’t exactly stopped, although it I am sure the manufacturer’s lawyers would have aneurysms). Biking with Brad demonstrates how much you can haul on a Big Dummy. But I’m hardly alone. 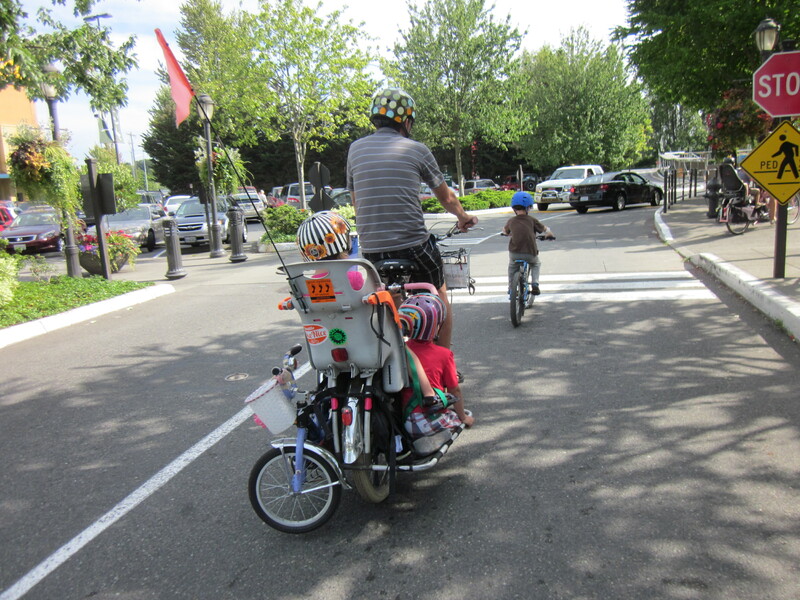 Family Ride is a one-woman toy shop on a Big Dummy, and A Simple Six put five people on a Yuba Mundo. I saw a photo of a dryer being carried on a Bullitt. When the Yuba Boda Boda and Kinn Cascade Flyer midtails came out, one of the first questions I heard people ask was whether there was a way to squeeze two or three kids on there. Definitely two: I’ve carried both my kids on the back of the MinUte when they’re not in a fighting mood. Something about cargo bikes makes you want to tempt fate. 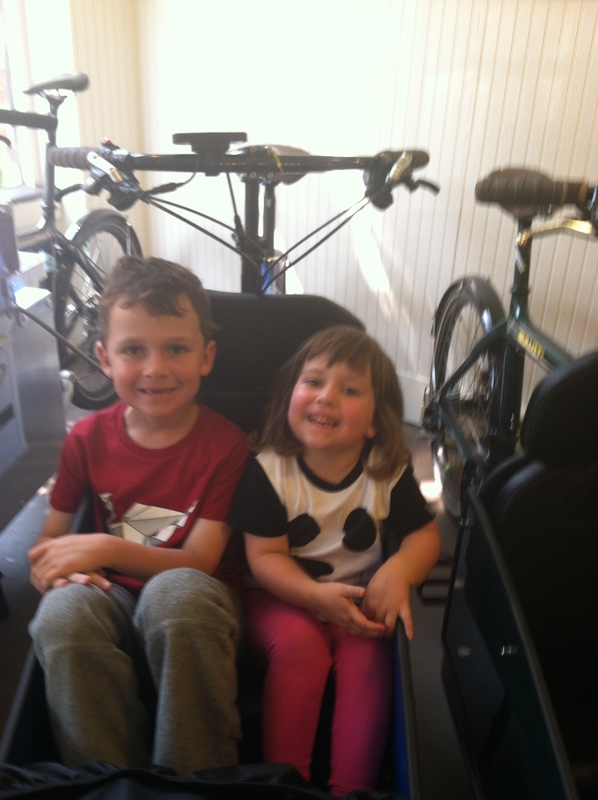 Even last summer when we rented the Bullitt, both kids were sometimes willing to ride together. So it is perhaps no surprise that Matt has now gotten in on the act. 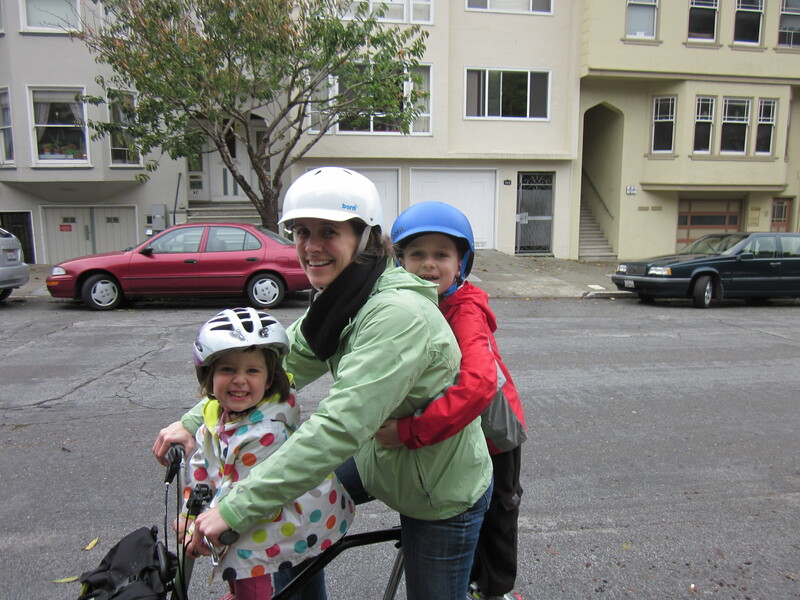 We’d had the Bullitt for less than a month when Matt took our son to a birthday party on it. When he came home he mentioned that he’d taken a ride with a few kids. On further questioning he admitted it was four kids, all in the box at the same time. I didn’t even think this was possible unless they were really little, but found out that the kids in question were a 7-year-old, his 5-year-old sister, and a pair of 4-year-old twins. I was depressed that he didn’t get a picture, but I can’t really complain, because I also didn’t get a picture when I hauled our PTA president (over six feet tall and wearing in a three-piece suit) in the box of the Bullitt. And we have the standard narrow box, not a custom box intended to carry multiple kids. 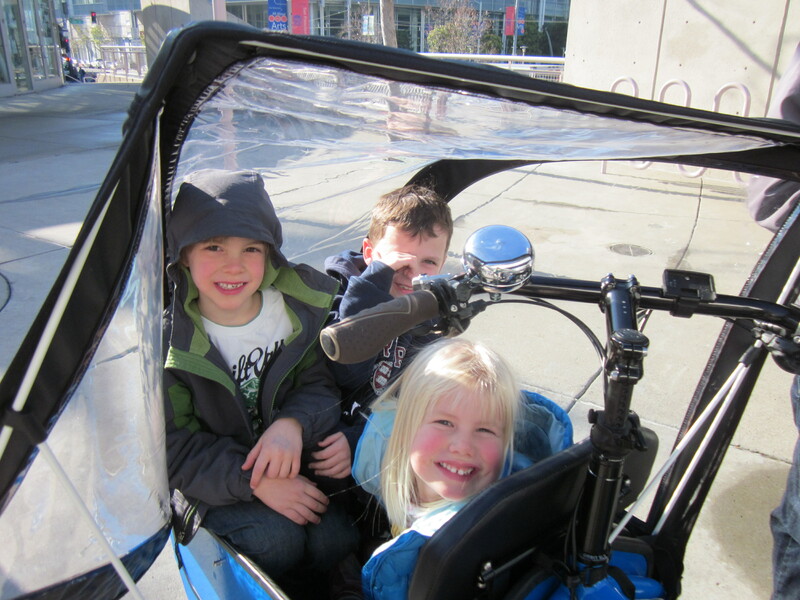 Loading up: three kids in the box of our Bullitt bicycle. Over the winter break we met some friends at the San Francisco Children’s Creativity Museum, which our daughter is finally old enough to really enjoy. Because it was a cold day we had the rain cover on the Bullitt, so I was a little skeptical when they wanted to try riding in the box with our son (our daughter was busy climbing the bike racks and wasn’t interested). But to my surprise, you can in fact pack two 7-year-olds and a 5-year-old in the box of a Bullitt with a rain cover on top. They didn’t have helmets so Matt rode them slowly around Yerba Buena Gardens, but credit to him; it may have been a slow ride but he took them up and down two stories of elevation. It looked pretty cramped in there, but their verdict was, “It was AWESOME!” I completely underestimated the bike when we tried it last summer. So how many kids could you put on a Bullitt? Up to four kids in the box if the weather is good and they don’t need the cover. Matt didn’t put any of them on the top tube, but he says he could have handled it. And our son sometimes rides on the Roland add+bike in back as well. I wouldn’t take a bike loaded up that way either up or down a hill. But if I ever see anyone try it, I’ll definitely take a picture. Cool. This is basically a narrow car that you pedal. Like it! Thank you for a great article. I’m hoping four on a bullitt is going to work as we have one set of twins that are two, and another set of twins on the way! Our bullitt is also on the way and I’ll be building a box for four. Will have to wait a while for the younger twins to ride in the box but we’re planning ahead! is that the splendid cycles rain cover on your bullitt?